MAGICK RIVER: Barisan Backbenchers Club Shaken By Political Earthquake! Barisan Backbenchers Club Shaken By Political Earthquake! A strong earthquake measuring 6.1 on the Richter scale struck Taiwan Tuesday, 9 September, but there were no immediate reports of fatalities or damage. The quake, which struck at 3:43 pm (0743 GMT), shook high-rise buildings in Taipei, sending jittery residents into the streets. The quake was centred 86 kilometers east of the north-eastern coastal county of Ilan at a depth of 89 kilometers, said officials with the Central Weather Bureau's earthquake centre. 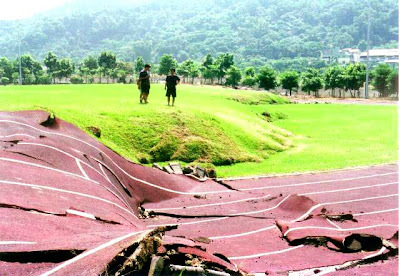 The officials said the earthquake was felt in most parts of Taiwan. Police said initial checks showed no casualties or damage. 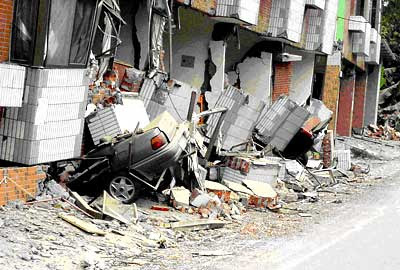 Earthquakes take place in Taiwan frequently because the island sits on a seismically active stretch of the Pacific basin, but most quakes occur under the sea. I guess the BN backbenchers arrived just in time to feel the effects of the political earthquake back home rippling out all the way to Taiwan. Perhaps they ought to abandon their attempt to study Taiwanese agricultural methods - and examine their own conscience instead? 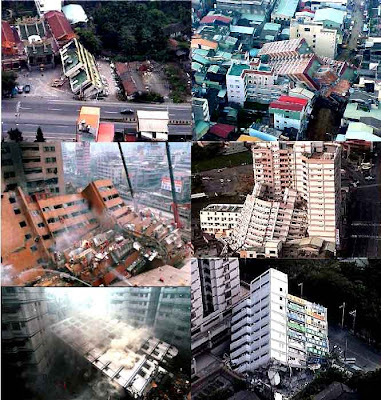 Incidentally, these images of destruction are from previous quakes that have hit Taiwan. I just wanted to dramatize the issue a bit. There's absolutely no doubt about it: Umno/BN is ACCURSED! Whatever they do goes horribly, hilariously WRONG! They say Altantuya Shaariibuu was descended from Siberian shamans and possessed exceptional witchy powers. Abdul Razak Baginda told his private investigator, Balasubramaniam (the one who later disappeared after withdrawing his sensational statutory declaration) that he didn't dare look the Mongolian beauty in the eye for fear of bewitchment. When a local witch took it upon herself to wreak deadly privatized TV drama-style vengeance, she unwittingly brought upon herself, her pink-lipped husband, and his political party an everlasting curse a hundred times worse than Mahsuri's legendary curse on Langkawi. Well, BN backbenchers on your compulsory, all-expenses-paid vacation in Taiwan - do you really want to remain embedded in an accursed party? Hee hee hee. Wicked! Divinely wicked of you but I love it;). You sure made your point and I hope it rattles those BN backbenchers and their family members to the core of their beings. 'Tis about time they realize that when the real earthquake comes, they will have no place to hide. When they mess with the best (alternative govt), they will perish with the rest. Reformasi! Malaysia will be better without those bloodsuckers! Dano, the whole world will be healthier when the vampire bloodlines are rehabilitated, redeemed, and reintegrated with the rest of the biosphere - the truly stubborn ones will simply vanish as the rest of us begin to oscillate at a subtler atomic frequency. And, to be sure, we're already in the process of mass ascension. Political and geopolitical upheavals are symptomatic of the swift transformations signifying the convergence of cosmic evolutionary cycles. Trying to escape tsunami back home, they come face to face with an earthquake. But some among them may be oblivious to this. They thought they had an earth-shaking climactic moment while in bed at some brothel in Taiwan. Bung Mokhtar & Tiong Official Study Tours Sdn Bhd are offering a special promotion for all Pakatan Rakyat MPs who wish to defect to BN: A 10-DAY ALL-EXPENSES=PAID VACATION IN KEPALA BATAS, PEKAN & KUBANG PASU - PLUS RM15 MILLION ANGPOW! SIGN UP TODAY!! !